One of my favorite things to do in the world is to decorate, and what better place to decorate than your very own book shelf!!!!! I love coffee table books, old books, vintage books about poetry, just pretty much all books, and to be able to mix them up with some of my favorite things was just heaven! Now, I was just left with all of these books and decor pieces and nowhere to put them. Fortunately when we moved, we had this giant space indented in our living room that would be perfect for a built-in bookshelf!!!!! So, of course I was over the moon with excitement when we found an amazing company, Boston Built In Cabinetry, to help with my vision and build the bookshelf of my dreams!!! 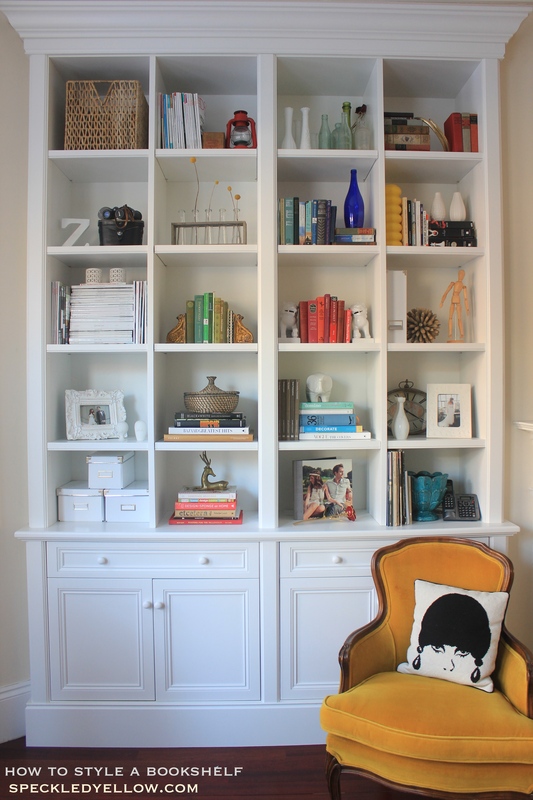 As I was arranging what would go in each shelf, I came up with a list of methods I used to make the book shelf look styled, clean, organized, and fun! 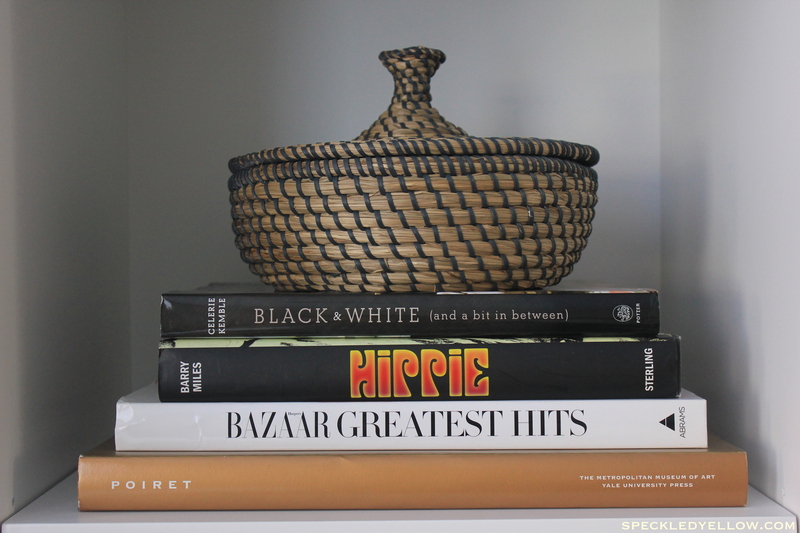 My list of how to style a bookshelf……..
1. 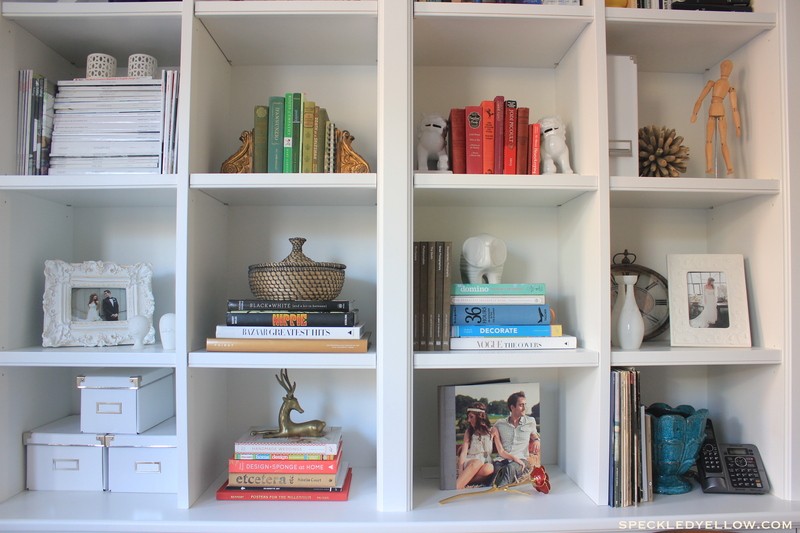 Arrange Your Books by Color: Group books in terms of the color story they make. You can even find your favorite hard back classic books at book thrift shops! They always come in fabulous shades of colors and have a unique beautiful style to them. 2. 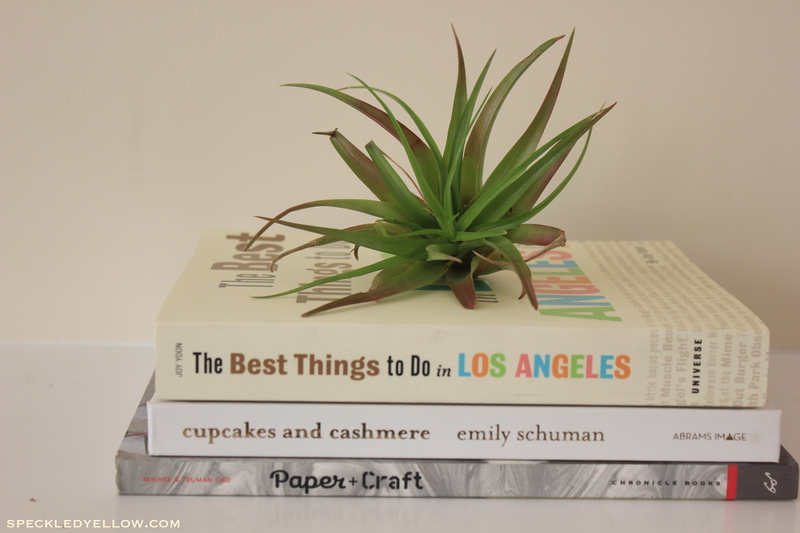 Mix up Your Book Placement: Not all books have to go in the same direction. Mix it up! Some can be vertical while others horizontal. I also love when the larger books are at the base and each book on top becomes smaller to create an upside-down cone shape! 3. 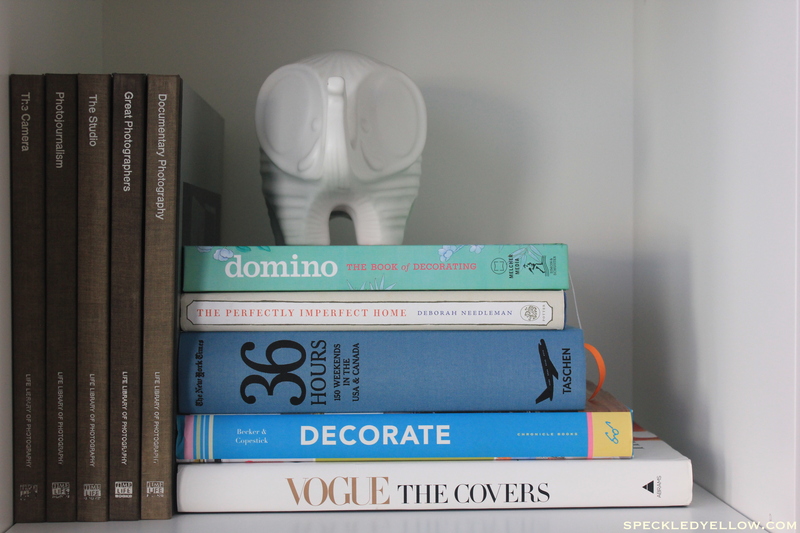 Use Fun Decorative Objects: Such as unique shape vases (like my bright yellow one on the top right corner that I got at Ikea years ago), animal objects (I love elephants and received this Jonathan Adler Elephant Bank as a wedding gift), and artwork or framed pictures. I also checked out some vintage thrift shops and flea markets for cool figures, book ends, or anything that looked interesting such as my binoculars. Don’t forget to look in your Grandmother’s basement or attic! 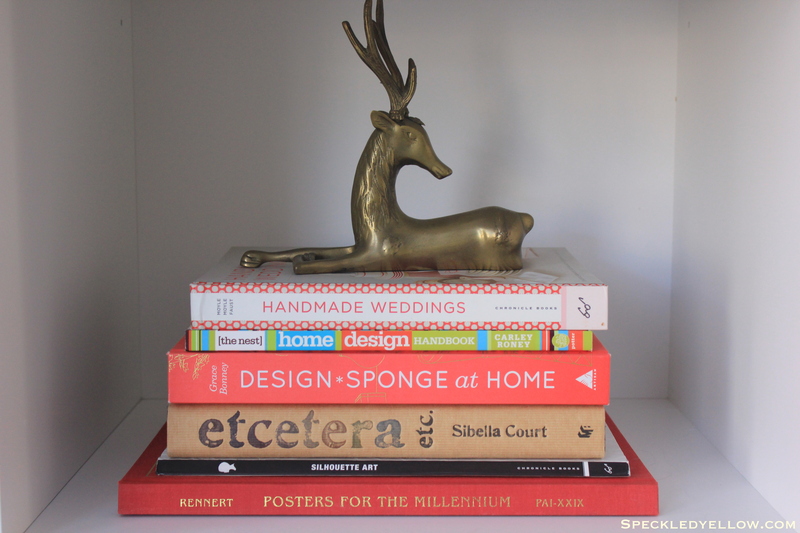 I was lucky enough to get my vintage brass deer from her that looks freakin amazing on top of some books. Marshals,Target, and West Elm always have some awesome things as well. 4. Including the Odd: Think plants, artwork, and antlers. I love using airplants and cactuses. 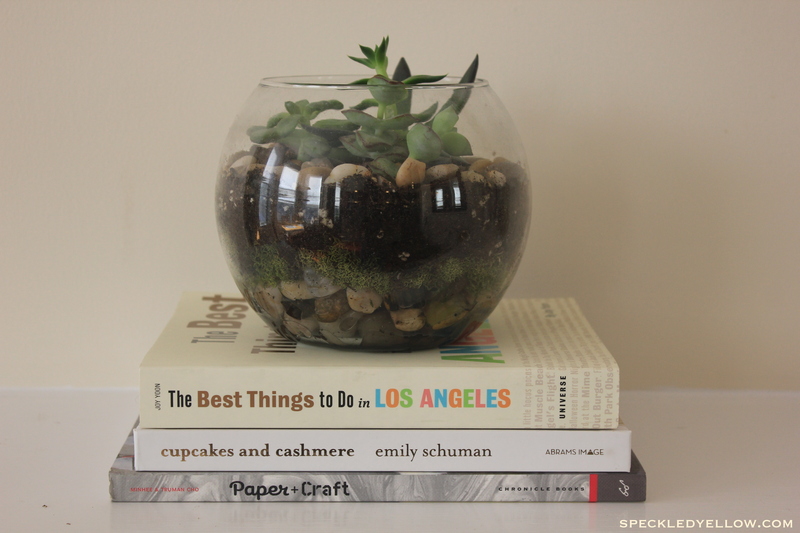 See below for pictures of some ideas…..
Want more pictures of my bookshelf?? Click below!